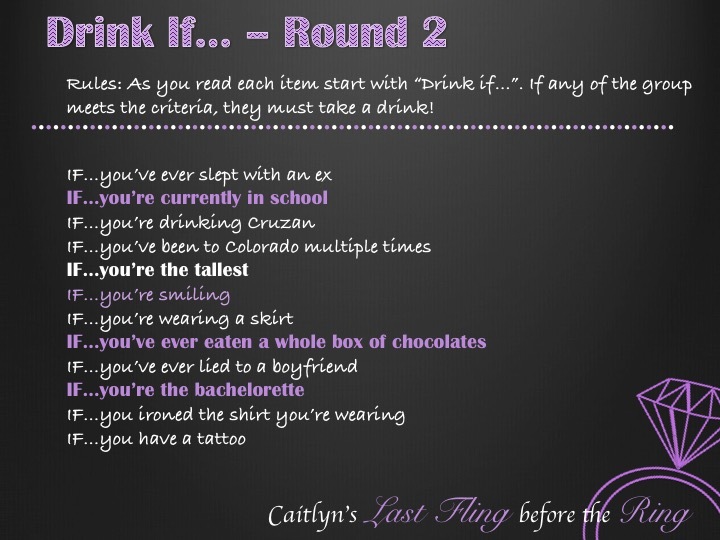 Once Caitlyn’s family left, it was time for some of the more traditional bachelorette games to begin!! 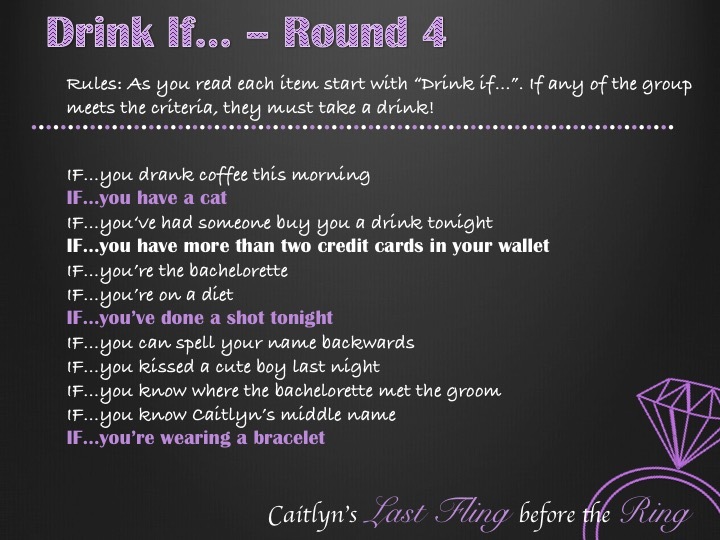 I conspired with some of Caitlyn’s friends and her fiancee to come up with really embarrassing and challenging tasks. 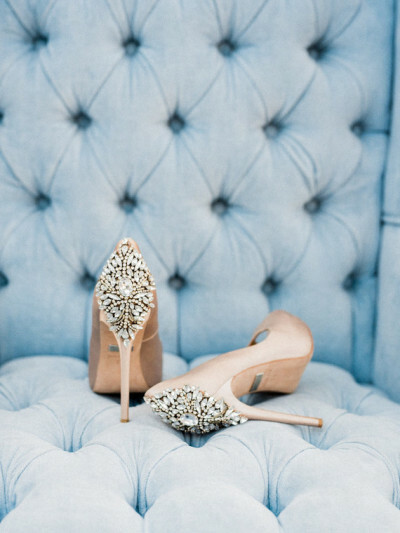 Her fiancee even required that she answer one of the questions on the Groom Quiz word for word as his answer! Penalty for an incorrect answer required a drink, which is why it’s smart to stock a bottle of the bride’s favorite alcohol in the room with you (it’s also much cheaper than opening those teensy mini bar bottles). 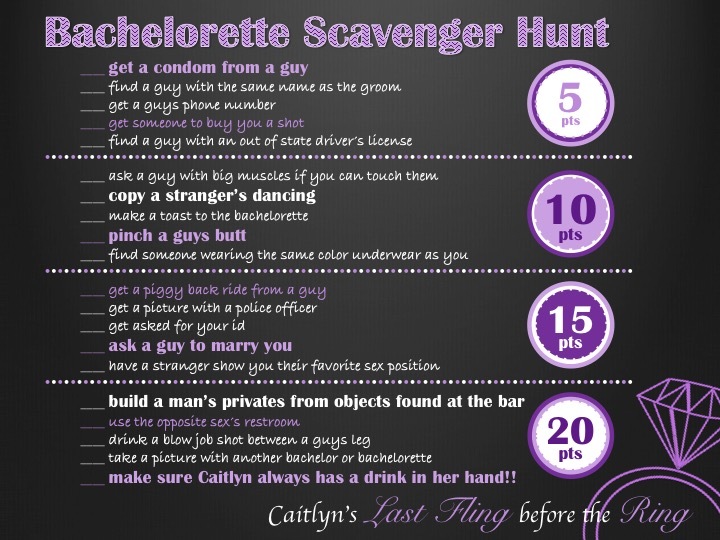 The night included three different games: The Groom Quiz, Drink If…, and the traditional Bachelorette Scavenger Hunt! 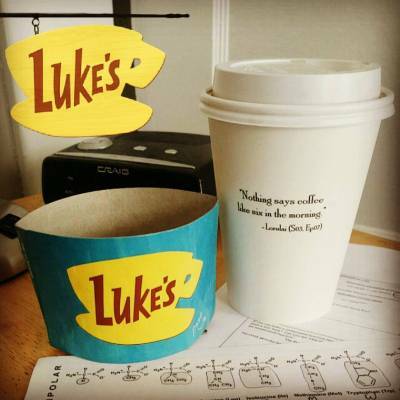 I designed them in PowerPoint, before having them printed on card stock and tucked into the favor bags (to avoid prying eyes). As a gift to the bride, I also had a few extra copies printed which she could then keep as a memory. 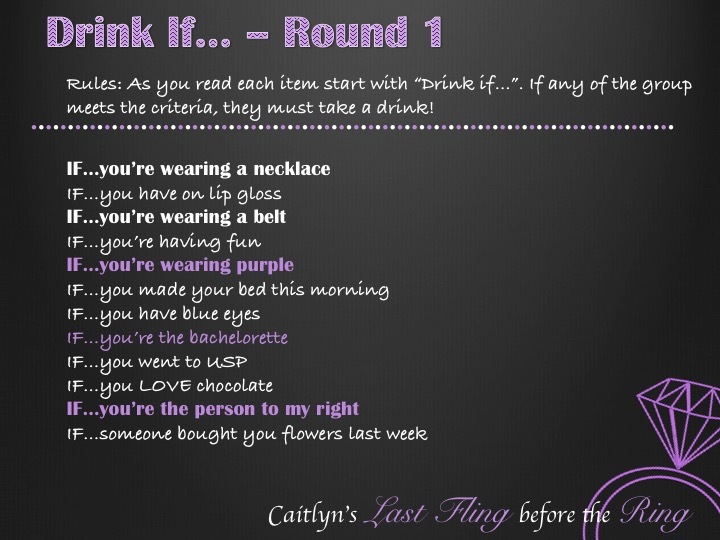 We started the night with The Groom Quiz (where she was able to answer some of the more embarrassing questions in the privacy of the hotel room), before moving on to Drink If…, and ending with enough liquid courage to complete some of the crazier tasks on the Scavenger Hunt. I’ve included copies of the games below. Please email me at favorsandfestivities@gmail.com if you would like me to adapt the PowerPoint files for you! Be sure to check out Pt.’s 1, 2, and 4 for details about the itinerary, decorations, and party favors!